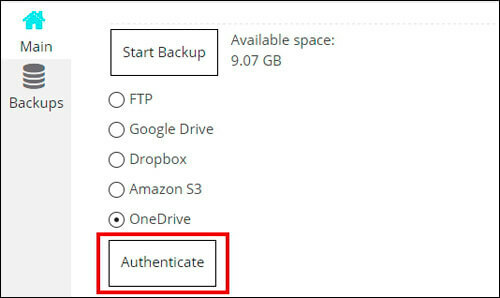 To create backup to Google Drive, Dropbox, Amazon S3 or OneDrive, at first you need to authenticate your account. 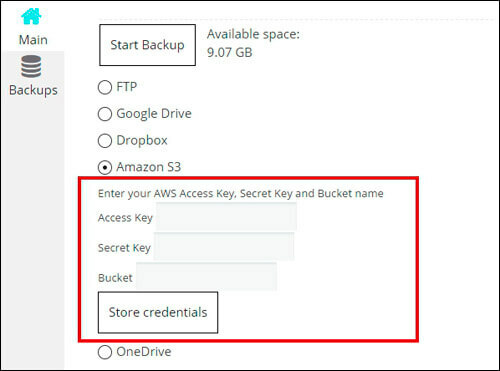 For all cloud services (except Amazon S3) it is very easy – just click “Authenticate”. If prompted request for permission to access to your account – press “Allow” button to give permissions to upload the backup files on your account. Then on your cloud service will be created “Backup by Supsystic” folder with one more folder inside (folder with the name of your site), where the backups will be stored. From the navigation menu, click Users. Click User Actions, and then click Manage Access Keys. After these steps – enter the keys and name of the basket in the appropriate fields, then click “Store Credentials” button. You can select several items at one time. If you choose a full backup – all checkboxes will be automatically activated (including the database backup). Specify the warehouse where the data is to be backed up – if ‘Use relative path’ checkbox has been set up, the path will be set against in the root directory, where the WordPress is installed. If ‘Use relative path’ checkbox has been of, the full path to the disk root should be specified in the Warehouse field. 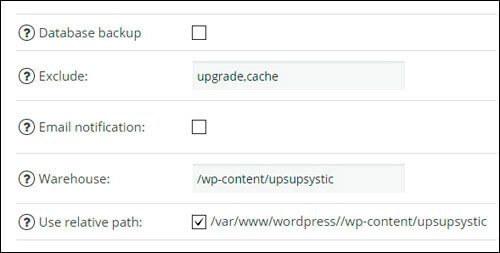 Use relative path – if the checkbox has been set up, then the backup path must be specified in the Warehouse field against the root directory, where the WordPress is installed. if the checkbox has been off, then the backup path must be specified in the Warehouse field against the disk root. After you have selected the cloud storage and have specified all the settings, click “Start Backup”. Wait while your site is being backed up. It can take a while if your website is large. It depends on your site and hosting how much time will take the process. While plugin is backing up your website, you are not able to create another backup. On Backups tab will appear a new entry with Database ( if you marked Full Backup or Database Backup) and Filesystem backup files. On top will be shown where has been made backup, the ID of backup files, the date and time of the backup. You can restore, download (only if it was backup to FTP server) or delete backup, simply click on the appropriate button. Also here you can view the log file of backup – just clicking “Show Backup Log”. In order to restore the backup you need to go to the Backups tab, select the backup files you want and click “Restore” button. When you see the message “Done!” – restoration will be completed. 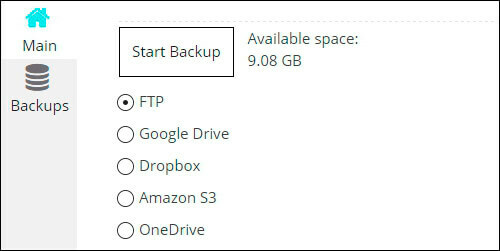 If the backup you want to restore is on your computer, then upload it to the folder on the FTP server where you store the other backups. 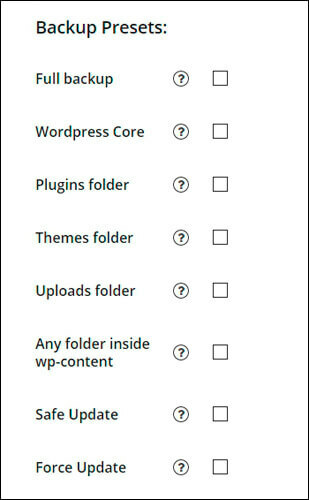 By default backup is stored in ‘upsupsystic’ folder (you can find it in the root directory, where the WordPress is installed, using this path /wp-content/upsupsystic/). 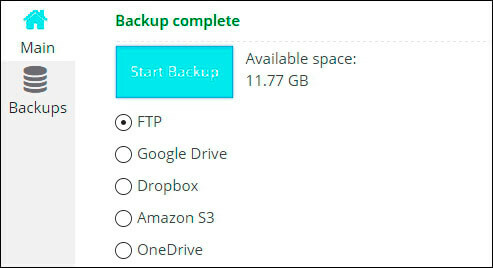 Then files of this backup will appear on the Backups tab and you will be able to restore them.